We here at DK Billiards are proud to be an Authorized dealer of the Aramith FusionTable. It has come to our attention that CusZoom.com is selling their own knock-off version of the FusionTable using Aramith’s trademarked photographs. We have repeatedly called this to the attention of Aramith, but the photos have not been removed. It is misleading and a dishonest way of doing business. Please do not be lured by too-good-to-be-true prices and fooled by photographs they do not have permission to use. 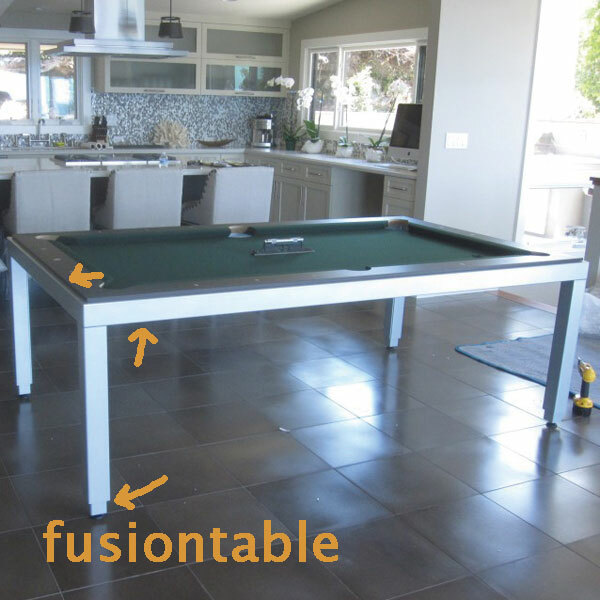 CusZoom is not an authorized dealer of the FusionTable by Aramith and their “Modena” dining room combination pool table is a rip-off. At first glance, the tables look the same, but upon closer inspection you can see the differences. Note the difference in thickness of the frame and legs. The “Modena” is not as sleek as the Fusion due to the patent-pending pocket design and frame construction. The top wooden rails are different. Notice the “Modena” rail protrudes to the frame’s edge, whereas the Fusion’s rail has a small lip to distinguish wood from metal. This has to do with the fact that the Fusion rail is thicker than it appears and fits like a puzzle piece into the metal frame as opposed to the wood top rail just being glued to the metal. Then, there is the ability to raise and lower the Fusion. The knock-off version not only looks huge, but would be difficult to dine at with the leaves in place as pool table height is a few inches higher than dining height. The FusionTable by Aramith is a quality product that is not only well designed but plays great. It really is like having the best of both worlds. Billiard Gameroom and Dining Room – switch as you please.